← The East End’s ‘engine of progression’. Education, like all human endeavour, requires conflict, struggle, challenge, disagreement, argument, difference, dialectic, dialogue. If we want to learn or make anything new, we need to reach towards what we don’t know, to seek out the unknown. Education, and life itself, can be thought of as a constant struggle at the frontiers of our ignorance; a struggle to sharpen our understanding of the world in the hope of making some impact on it. But conflict can be frightening, threatening. Many people have good reason to fear conflict because to them it is associated with real hardship, danger and even violence. A new unknown is not welcome if past unknowns have been connected with danger. So, to be a place of ‘learning risk’, the educational space has to be free of actual personal risk. Human civilisation has been at least partly about mastering conflict and making it less threatening and more creative. As the possibilities of human action become greater and societies become more complex, it becomes more and more vital to describe, manage and codify conflict. Communication, discussion, rationality, debate, government, politics, treaties and agreements, legal systems, ideas about respect, human rights and equality can all be seen as means to contain conflict and allow human potential to flourish in ways which do not constantly jeopardise our personal safety. Even the processes of war, which are essentially about mass violence, have be subject to rules and conventions. We have a duty of care and a responsibility to keep our students safe from violence, abuse, harassment, discrimination, physical harm or exploitation. We need to protect them and nurture them as they learn about the world, but we also have a duty to tell them the truth about the world. This is not about encouraging a sense of victimhood, grievance or fragility but caring for them as they gain the confidence and strength of mind to take on the dangers which they will undoubtedly face. We also have a duty to explain and promote values of democracy, freedom and rights, the rule of law, respect for others and to develop the practice of those values. In other words, we need an education for full citizenship and I think that in England we’re still a long way from doing that effectively. I think what we need is a social pedagogy of agency, a pedagogy of possibility and empowerment. I don’t think this should be a ‘you can do anything if you try hard enough’ positivity and it’s not quite the same as the promotion of ‘character’ or ‘grit’. It needs to do more than promote a resilience which means being good at dealing with what life throws at you, or a wellbeing which means being happy or satisfied with life. When faced with injustice, discrimination or inequality our students need to know that things could be better and to be able to do something about those things that something can be done about. Everything we do in our education settings should aim to promote students’ greater autonomy and agency and their critical understanding of the world as it is, recognising its complexity and the interdependence and inter-relationship of self and others. We want our students to think and act well. We should assume that our students will be more than subjects – but that will want to be agents – out there in the world, doing things and aiming to making a difference. Just as young children need to learn to master their raw emotions and see the world through others’ eyes in order to learn to live and work with others, we all need to learn how to be critical, sceptical, how to respectfully disagree and engage constructively with others in society. This learning has to be taken step by step with the challenge and risk of failure managed. Where does this place us as educators in what we all agree is a time of polarisation and division in our society? I think we need to develop our students’ understanding and skill well beyond what is currently expected. Our schools and colleges need to be places where students can take a step back from the world in order to study it better and prepare to step up to a role in that world. We need to think of our education system as the workshop where people hone their rational, critical faculties and ask all the questions they have about the world and start to explore the answers. What does this mean when we are confronted with divisive and controversial topics such as Brexit and Trump? Like any other aspect of the real world, these are legitimate subjects of study and cannot be sidestepped. They need to be understood and our approach should be to use them as an opportunity to be analytical and rational and to consider the world from different perspectives rather than pressing students to have an opinion. We have a duty to challenge fake news and irrational beliefs and superstitions. We cannot shy away from controversy but face it head on. Our objectivity has to be reasoned and well-informed; not an ‘equal value to every opinion’ neutrality. We need to be radical rationalists and rigorous explainers, partisans of enlightenment, which of course sometimes means ‘taking sides’ when core values are challenged or threatened. We shouldn’t aim to propagandize but starting from a set of beliefs and values which we know to be necessary for society to function, we should aim to ‘activate’ our students so they can build their own agency. Of course we cannot pretend that it’s possible to achieve absolute objectivity or academic detachment. We also need to recognize that both students and teachers bring a wide range of experiences and identities, and prejudices, to the learning process. Our identities, our histories and our feelings are important elements which will shape our approach to our studies. Nevertheless, I do think the task of educators is primarily to help learners develop a particular distinctive identity as students of the world. This need not replace their existing identities but it is what will help them reach out beyond what they know to what they could know; from what they are to what they could be. 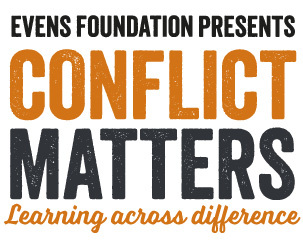 Should we teach conflict resolution? Can conflict ever be fully resolved? We can understand it, explain it, come to terms with it and practice ways to manage it and move things forward without resorting to violence or pretending it doesn’t exist. But we absolutely need it; it is a prerequisite of human progress and learning. And so, we should value understanding, use increasingly complex analyses and model the skills needed for robust debate, productive dialogue and deliberative democracy. This is what will help us embrace and channel conflict. Hannah Arendt’s statement that “education is the point at which we decide whether we love the world enough to take responsibility for it” reminds us that the education is a social project which starts with people who care about something worth caring about and want to be in a position to do something about it. This entry was posted in Education, Teaching and learning and tagged agency, citizenship education, conflict, conflict matters, controversy, Education, Evens Foundation, Hannah Arendt, objectivity, pedagogy, rationalism, Social change, values. Bookmark the permalink.